Come see what Prospect Heights has to offer! This is a Town Square Publication created and produced for the Wheeling/Prospect Heights Area Chamber of Commerce 2 Community Blvd., Ste. 203 | Wheeling, IL 60090 Phone: (847) 541-0170 | Fax: (847) 541-0296 www.wphchamber.com Copyright© 2018 Town Square Publications 155 E. Algonquin Rd. | Arlington Heights, IL 60005 www.townsquarepublications.com Every effort has been made to ensure the accuracy of the information in this publication. The Chamber and Town Square assume no responsibility for misinformation. Please contact the Chamber with any additions or corrections. Reproduction in whole or in part without permission of the Chamber and Town Square is prohibited. NEW CUSTOMERS TAKE AN ADDITIONAL $5 OFF Lube where applicable, new oil & ﬁlter installed. Up to 5qts. major brand oil &free preventive maintenance inspection. With this coupon. Not valid with other offers or prior services. Joe Vito Lavelle Law Ltd.
he WPH Chamber is an active, membership-based organization committed to maintaining a healthy and progressive business environment. Each Chamber member has access to programs, events, publications and benefits that strengthen and promote the business community. The Chamber partners with local, state and federal government to attract and retain commercial and industrial development. Joint initiatives include providing assistance to existing and prospective businesses. MISSION STATEMENT To provide resources and an environment that promotes the success of our member businesses.  Creates Member Value – by providing an effective return on investments of resources, time and participation.  Provides Leadership with a Network of Partners – encouraging a single vision for economic growth and prosperity. Joining a committee is the best way to get involved, meet area business leaders and help set the direction of the Chamber. All employees of the company are welcome to get involved.  Ambassadors Ambassadors are the face of the Chamber. These dedicated members are fully committed to furthering communitybased business, assisting with Chamber events, participating in ribbon cuttings and helping orchestrate membership campaigns. The ambassadors also welcome new members to the Chamber, and serve as educated contacts within the Chamber network.  Is a Member Driven Organization – focusing on programs and services that contribute to our members’ success. Conduct business on the green by planning, networking and playing. For the Wheeling/Prospects Heights area to be a highly innovative and business friendly region that attracts and retains businesses and intellectual capital. Plan and throw the greatest party in NorthShore Chicago and the surrounding areas. creating opportunities for all member businesses. the mission of the Chamber, increase visibility of membership benefits and host and promote all Chamber events. This group opens an avenue of communication between restaurants and hotels to meet the daily challenges of promotions and marketing.  Industrial & Manufacturing Committee The industrial and manufacturing business sectors are an essential cornerstone of our regional economy, particularly in Wheeling. The IMC exists to serve this critical base.  Network for Enterprising Women This networking group connects, educates and supports women of all business back-grounds and helps to build strategic alliances within our communities. This group seeks to share ideas, inspire entrepreneurial spirit and encourage women to pursue of long and successful careers in senior roles in their respective professions. 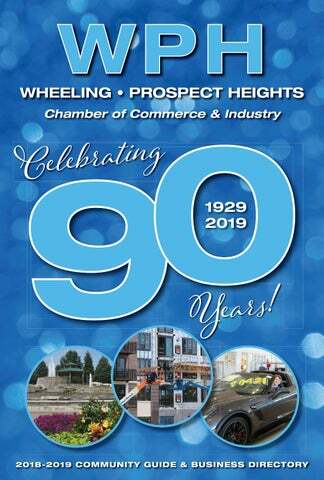 Wheeling Prospect Heights Area Chamber of Commerce is a 501 (c) (6) nonprofit membership organization that was founded in July 22, 1929.
n behalf of myself and the Wheeling Village Board, thank you for supporting the Wheeling / Prospect Heights Area Chamber of Commerce and Industry. The Chamber works collaboratively with the Village and supports local business expansion. The Chamber provides essential resources, programs, events, job fairs, business seminars and networking opportunities that help connect area businesses. I am a small business owner. I recognize that businesses small and large sustain our local economy by creating employment opportunities, meeting local shopping, dining, and professional service needs, providing business-tobusiness patronage, supplying tax revenues that support community services, and more. Wheeling is the hub of commerce and industry in the northwest suburbs home to over 850 licensed businesses across a range of 50 business sectors, with more than 14 million square feet of industrial space. Wheeling is likely best known as home to the beloved Restaurant Row along Milwaukee Avenue, which continues to attract visitors from throughout the North Shore and northwest suburban region. I am proud of our business community’s achievements and positive growth. The industrial vacancy rate of only 4 percent continues to reflect strong market demand. New spec industrial buildings were constructed for the first time in over two decades and provide modern, prototype space for today’s growing industrial needs. Progress has been achieved on Wheeling Town Center, Northgate Crossing, the Whitely, Wolf Crossing, and Uptown 500 and we look forward to building on this momentum. Regional and national institutional investment firms recognize Wheeling’s potential thanks in part to the over $230 million in new development projects. The Wheeling Town Center’s residential building and retail portions are well underway and slated to open in early 2019 and the Northgate Crossing townhome development was recently completed. about to change in early 2019 with the development of the Wheeling Town Center. Wheeling is at a unique crossroads in the Village’s history evolving from a farming community to a major suburban center of commerce and industry with key manufacturers as well as big box retailers, hotels, specialty retail shops, and restaurants. Village President Pat Horcher said, “Village trustees are proud to see a new generation of professionals, first-time home owners, empty nesters, singles, and millennials making Wheeling their home. Wheeling’s diverse housing stock serves the needs a wide variety of residents from world-class condominiums, affordable rental properties and single-family homes on tree-lined streets.” While the big news in Wheeling is the transit-oriented development called Wheeling Town Center, which is under construction south of Dundee Road alongside the Wheeling Metra Station, exciting things are also happening elsewhere in the Village, according to Melaniphy. Uptown 500, a $90 million mixeduse development planned just north of Wheeling Town Center, will begin construction in summer of 2018 and will include 321 luxury apartment units and 10,500 square feet of retail space. A spike in residents is coming soon. In addition to the approximately 1,000 apartments that are springing up around Wheeling Town Center, D.R. Horton is constructing 39 townhouses on the former site of Deerfield Moving and Storage at 415 N. Wolf Road, known as “Wolf Crossing.” The Economic Development staff is also engaged in aggressive business attraction efforts focused upon regional, national and international businesses. Despite Wheeling’s mature status, there are prime properties available for development in Wheeling. At the intersection of Route 83 and Dundee Road, Melaniphy said the Village is targeting a sales-tax-producing use like a home improvement store, supercenter, auto dealership, or other junior-anchor retailers for the former Kmart site. And at the north end of the Village, Melaniphy said that they are working with ownership of the 17 vacant acres across the street from the Westin Hotel for a mixed-use development. This is the site immediately north of the Prairie Park condominium development. Sherwin-Williams Paint Store of wheeling, IL has exceptional quality paint, paint supplies, and stains to bring your ideas to life. Korean Cultural Center of Chicago Come & explore Korean culture with us! ©2016 Brookdale Senior Living Inc. All rights reserved. BROOKDALE SENIOR LIVING and BRINGING NEW LIFT TO SENIOR LIVING and the registered trademarks of Brookdale Senior Living Inc.
... AND EXPLORE NEW IDEAS AND GAIN NEW UNDERSTANDINGS AT ADDOLORATA VILLA When residents move into our beautiful senior living community, they are able to take advantage of countless educational programs as well as many opportunities for physical, social and spiritual wellness. Addolorata Villa ensures comfortable living for many years to come and assists our residents in having all their needs cared for and wishes fulfilled. ADDOLORATA VILLA OFFERS: • INDEPENDENT LIVING • ASSISTED LIVING • MEMORY SUPPORT • REHABILITATION SERVICES • SKILLED NURSING Call us at (847) 215-1600 or visit us on the web at www.addoloratavilla.com/np to learn more about our beautiful senior living community. are a short commute from Lake Forest and the other North Shore communities where top management may choose to live,” he added. He also cites Harper Community College and Wheeling High School, both of which are working to expose students to the advantages of working in modern manufacturing and training them to do so through job fairs, plant tours, workshops, courses, degrees, internships and apprenticeships. The Wheeling-Prospect Heights Chamber of Commerce and Industry also has an Industry and Manufacturing Committee that began as a subgroup and now has grown. It works to support current manufacturers and create further synergies by attracting additional manufacturers. Manufacturers who are active in the Wheeling-Prospect Heights Chamber of Commerce and Industry are some of Wheeling’s most ardent cheerleaders. Argon Medical Devices, a manufacturer of medical devices such as bone marrow and biopsy needles, as well as drainage catheter needles, moved to Wheeling from Skokie about 18 years ago. They had previously been known as Manan Medical, according to Karen Silverberg, Argon’s North American Director of Human Resources. The 300-plus employee firm is pleased with Wheeling’s proximity to various modes of transportation for its goods but is challenged by the shortage of public transportation for prospective shift work employees, Silverberg noted. High Chicago area wages and a shortage of young people interested in manufacturing jobs have prompted Argon to invest more heavily than others in robotics. They are also working through High School District 214 and the Illinois Department of Employment Security to recruit additional workers and to convince parents that manufacturing can be a great career for their young adult children. compare insurance carriers or ways to recruit new talent. Together we are creating best business practices.” The committee includes members who are not only in manufacturing, but also in finance, human resources, software engineering and other sectors who offer potential services to manufacturers and are interested in helping manufacturers thrive in Wheeling. “I think the Industry and Manufacturing Committee membership will continue to go up and up. 15 years from now, I anticipate the membership to double,” Hestad said. This is further evidence that manufacturing is strong and leaders in this sector will continue to be instrumental advocates for Wheeling’s prosperous industry and commerce. Buffalo Grove Bank & Trust is a branch of Northbrook Bank & Trust Company. Your source for the best in close tolerance strip and edged products. DUNDEE & WOLF AUTOMOTIVE SERVICES, INC.
advertising and marketing efforts. “We also provide scored and folded brochures and marketing materials that no one wants to produce on their desktop printer,” Rodin said, “and while most of our customers come from Wheeling, Buffalo Grove, Northbrook and Deerfield, some who have moved away still use us for jobs and we ship the finished products to them.” Minuteman Press has been a member of the WheelingProspect Heights Chamber for its entire 25 years in business. “I joined the Chamber for the opportunity to network with other businesses,” he said. “But I also belong to the Chamber for the good of the community. I want to see Wheeling remain an active and viable business community and want to do my part to support that effort. “We take pride in the service we provide to our customers. We help them solve their problems, sometimes with unusual solutions, such as business cards in the shape of a rabbit.” Rodin is currently a member of the Chamber’s marketing committee. He has also served as a Chamber board member and its president and is a member and past president of the Wheeling Rotary Club. Proudly supporting the Wheeling Community for over 25 years by offering customized solutions and individualized service for all of your personal, business and home financing needs. Mention this ad at any of our locations to open up a free personal checking account! For a full list of our products and services, visit us online at www.devonbank.com! Rick Rosen is arguably one of the busiest people in Wheeling, even though he retired from running his family’s manufacturing business several years ago. A high energy individual who loves to help others and better our community, sharing this ideal with many in the Chamber membership. Rosen joined the Chamber as the Wheeling Rotary’s representative and has thrown himself into the activities wholeheartedly. In fact, he recently retired from the Chamber’s board of directors and worked with its ambassador committee. Beyond the Chamber, Rosen is in his ninth year as a Wheeling Park District Commissioner and is a former member of the School District 21 Board. He is also a member of the Indian Trails Library Foundation Board and is chairman of the Wheeling Township Senior Advisory Board. When he served as president of the Northwest Suburban Interfaith Council, he initiated their popular 5K race which they call the “I Walk to End Community Hunger” event. Monies raised go directly to support four faith-based food pantries and over five years they have raised over $24,000 to support those pantries each summer. He and two friends also created Wheeling’s “Helping Hand” charity to help fund the Wheeling Police Department’s “Shop with the Cops” event and to provide warm winter coats to students in need. And Rosen has served on the boards of directors of both OMNI Youth Service and the United Way of Wheeling/Buffalo Grove. The list of Rosen’s involvements continues to include helping educate teens about the dangers of drugs and alcohol (through “Linked Together”) and even acting as the Wheeling Historical Society’s Santa Claus during the annual Lollipop Lane event. “I love volunteering. I consider myself fortunate and blessed for many reasons,” Rosen said. “I want to give back to a community where I felt I could make a difference and Wheeling, Prospect Heights and Buffalo Grove have fit that need. “I was thrilled to be honored with the Wheeling/Prospect Heights Chamber of Commerce’s Member of the Year Award recently,” Rosen said. “I love participating in the Chamber as the member/representative from the Wheeling Rotary. “I especially appreciate the work we do for small and mid-sized businesses in our communities by educating and creating relationships among and between our members,” he said. Mention this WPH publication when you call; In celebration our gift to you of $104.00 off your NEW invoice of $500.00 or more. HIGHLY QUALIFIED TEACHERS INTEGRATED CURRICULA INDIVIDUALIZED ATTENTION GOSPEL CENTERED LEARNING Full & Half-Day Pre-School, Full Day Kindergarten 1st - 8th Grade, Before & After Care Available Financial assistance available to qualifying families. We Celebrate and Embrace Multi-Cultures! CRC RENOVATION & EXPANSION The Wheeling Park District officially broke ground on an $18.8 million renovation and expansion of the Community Recreation Center Monday, May 7, during a ceremony attended by the community. The project will add 42,000 square feet of space, including another gymnasium and enlarged fitness center, and renovate the existing facility at 100 Community Boulevard in Wheeling. It will take about 16 months to complete and the CRC will remain open throughout construction so that programming and services can continue. “Our residents and guests have voiced a strong desire for more gym space, an expanded fitness center and additional larger program areas," said Jan Buchs, Executive Director, Wheeling Park District. “It is our responsibility to meet the needs of the community. From their input and feedback, we have developed a plan and look forward to offering a 21st century facility to better serve our residents and guests now and into the future.” With several new apartment developments along Dundee Road underway as well as Senior Services relocating to the CRC, the park district is growing its facility to accommodate more residents. The enlarged Fitness Center will incorporate more cardio and strength equipment, areas for stretching and personal training, space for group exercise and new locker rooms. A separate entrance into the fitness area will potentially allow the park district to increase hours of operation. A second gym will provide more open gym time and additional space for leagues and tournaments. In addition, the existing CRC spaces will be renovated. About $14 million of the cost will be covered by funds in the capital reserve budget. An intergovernmental agreement was reached with the Village of Wheeling to apply $1.8 million in tax increment financing funds. The remaining amount would be paid for by issuing debt. well as an artificial rock feature. New belt swings and a tire swing also have been added, in addition to an individual stand-and-spin play piece. The new surfacing matches the existing safety surface. A new, attractive trellis/shelter also has been constructed and benches are provided around the playground offering multiple areas for seating. 18-holes and beautiful landscaped grounds. In the last several years, the district has installed a short game practice area at the golf course in collaboration with St. Viator High School and created a nature preserve at Lions Park in collaboration with ComEd and the Natural Resource Commission. A racquetball court at the recreation center was converted into a fitness studio and the tennis courts at both Lions and Country Gardens Parks were renovated. New playground equipment was installed at both School Street and Lions Parks. An additional bus and fleet of golf carts were purchased. It is evident that ongoing efforts to improve facilities, amenities and programs are top priorities for the district. A vibrant park district is another incentive for young people to return to Prospect Heights, raise their own families and create more memories. The Old Orchard Country Club is the perfect venue to make memories celebrating a wedding, shower or retirement. Floor-to-ceiling window views of the ponds, fountains, trees and flowered paths provide a gorgeous backdrop for events. The ballroom can host up to 400 guests. If you are seeking a gorgeous venue with an amazing menu, 2019 dates are still available to host an event at the country club. Dates still available for 2019! Receive a 15% discount for bringing in this ad. Don’t delay! Town Square Publications is grateful for the opportunity to partner with the Wheeling • Prospect Heights Chamber of Commerce & Industry to produce this high-quality print and digitally integrated product. We hope you enjoy the publication and ask you to consider supporting the advertisers who made this possible. As a proud sponsor and member of chambers all across the U.S., Town Square Publications is uniquely positioned to showcase your community Chamber of Commerce and its business members. 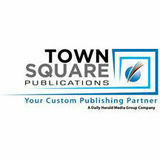 For more information on the many other great communities and organizations featured, visit our website at www.townsquarepublications.com. Your Hometown Pizzeria for 39 years!! Owner Operated! Fantastic Food, Quality Service, and Overwhelming Value Come by, We’ll Treat you like Family! Call us for Special Event Celebrations, Catering, Delivery, Dine-In or Carry-Out State I.D.A Approved Pizzeria • State License #11842 We can Supply Pizzas To Any School In Illinois. Call For Additional Information. This is unbelievable. A pizza place that opens at 6 a.m.
ttending events gives you a chance to network, make connections, market your business and meet potential clients and/or get referrals in the future. All employees of the company are invited to attend and get involved. GOLF Conduct business on the green by planning, networking and playing. BUSINESS AFTER HOURS A monthly gathering that helps forge new business relationships and renew existing bonds. BAHs are held to provide an opportunity for chamber members to network while member hosts showcase their business and facility. WOMENâ&#x20AC;&#x2122;S NETWORKING These monthly networking opportunities provide women of all business backgrounds to build strategic alliances and inspire entrepreneurial spirit. SPECIAL PRESENTATIONS/ LUNCH & LEARNS What can we learn? A variety of topics ranging from social media training, financial and legal implications in the workforce, tapping into employee creativity, etc. You tell us and we will listen. To translate and execute a thought...into a space in time that infinitely captures the most precious and memorable moments of life with impeccable precision, style, humility and grace. Royal Events offers a variety of packages to meet your specific event planning needs. While the packages range in services offered, each includes consulting with a team of experts who have experience in event planning. If there is a package that doesn't quite fit what you're looking for, please contact us for individualized options. WORKFORCE DEVELOPMENT The Industrial and Manufacturing Committee conducts a “Career and Job Fair” annually to introduce graduating students to manufacturing jobs as well as to assist businesses around the area to hire and fill their open positions. STATE OF THE VILLAGE & THE CITY The president of the Village of Wheeling and the mayor of the City of Prospect Heights preview ongoing community initiatives, accomplishments and upcoming developments. TASTE OF THE TOWN A smorgasbord of tastings highlights the restaurants in Wheeling, Prospect Heights, and neighboring communities. The event highlights the culinary delights west of the City. Thousands of attendees converge during fall to get a taste of the famed Restaurant Row. Builders has expanded to our Wheeling neighborhood and is now open for business. Call today for a plant tour or stop by and say hello. We pride ourselves on providing a quality product in a timely fashion with great customer service. Please visit us at www.thebuildersco.com for more information. We look forward to being in your neighborhood. Commercial Lending Small Business and SBA Loans Treasury Management Service Employer Bank At Work program designed to reward customers for their everyday banking and Employer HSA Solutions designed to provide additional benefits for your employees and help with changes in your organization. Interested in finding out what it’s like to have Inland Bank in your corner? Contact us today at 1.877.908.6555 to learn more. Coming to Wheeling Town Center In 2019! Don’t wait, a banker is standing by to talk with you today!